I’ve been writing a book: Red Neck, Blue Collar, Atheist. And I’ve been really busy with Life, and all that entails, so I haven’t been posting much. But I went to see PZ Myers last night, in a talk at Syracuse University, and I see he mentioned me in his blog post, Early Morning on the Road, so I figured I’d better respond, just so people who click over to here know I’m not dead. I can say from this experience that if PZ ever comes within a 3-hour drive of where you live, you should make a point of going to see him. He gives a great talk, there was a stimulating Q&A after, and afterward we went to a nearby pub and quaffed (according to Terry Pratchett, quaffing is like drinking, only with more spillage) beers until late. Just FYI, I’m getting some last-stage feedback on the book from a few people, and I’d like to do the formal roll-out in early summer. The response so far has been overwhelmingly positive. 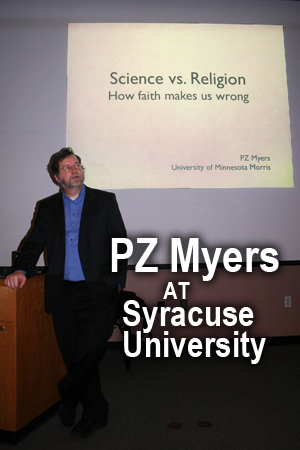 To the organizers of this talk, the great people at Syracuse U’s atheist group — great event, guys! Really nice meeting you, and I look forward to being on the other side of the podium when my fabulously successful book comes out. 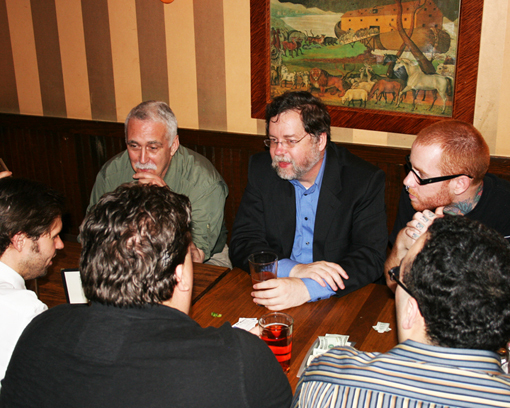 Below: PZ Quaffing with friends (Carl Buell just to the left) — and yes, that’s a pic of Noah’s Ark behind him.